Canadian Feed The Children is grateful for the amazing support of our donors – and we are always impressed by the fun and unique ways our supporters raise funds to help us achieve our mission. We had a summer filled with fun events – here is what has been happening! The Canadian Electrical Industry has been helping to fight childhood hunger with Canadian Feed The Children (CFTC) through a campaign called Power2Feed since 2008. This summer, the wonderful supporters behind Power2Feed helped raise nearly $18,000 through the Power2Feed Pie Challenge! On August 19th, at the Electro-Federation Canada’s 15th annual Federation Cup Gold Tournament, four top industry executives offered to be the brave participants of a pie-throwing contest. For every $1,000 raised, each executive had to take a cream pie in the face thrown by a more-than-willing colleague. Power2Feed has raised an incredible $1.1 million in support of CFTC’s nutrition and food security programs and has helped tens of thousands of children living in poverty. Thank you to everyone who was involved in this amazing (and messy) fundraiser! Click here to see a full photo gallery of the event from Electrical Business Magazine. A few months ago we received an email from 11-year-old Maddy from Grimsby, Ontario letting us know that she wanted to hold a bake sale in support of Canadian Feed The Children’s work. “I wanted to raise money for children less fortunate than I am,” Maddy said. Setting up a CFTC’s personalized fundraising page, Maddy began asking friends and family for donations with the help of her mother, Cari. 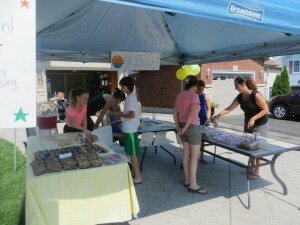 She held a bake sale as her main fundraising event. Between collecting online donations and sales from her bake sale, Maddy was able to raise over $1,100 for CFTC! That’s a great accomplishment, and we’re super proud of Maddy; she is definitely a professional fundraiser or event planner in the making! A huge thank you to Maddy, Cari, and everyone who supported this fundraising initiative – because of you we are helping children thrive!